The Chef & The Baker! Ian and Karen A.K.A. The Chef and the Baker moved into this space on McClure off of Knoxville last May and we went to the Open House and it was really impressive inside. I’ve been so busy I haven’t been back since then, so we’re overdue for a visit, so let’s get inside and see what’s going on in there! As I walked in, I saw a room that wasn’t here last time, so I went in and saw a familiar face, it’s my friend Shannon! She’s enjoying a salad for lunch and it was great to see her and catch up on things. Shannon’s a musician and she’s going to be performing a tribute to Leonard Cohen at The Red Barn this coming Sunday, November, 27 from 8 to 11PM. Shannon’s really a talented musician and vocalist so stop by and see the show if you can! Help support live music in Peoria! Okay, here’s the main dining area and as I looked in this room I saw yet another familiar face, Colleen from Technicraft sitting at the prestigious corner table with her friend, Mickalaya. Colleen’s showing off her cupcake and Mickalaya told me she saw me hitchhiking the other day on University Street. It was fun to chat with both of them and now since I’ve met Mickalaya maybe she’ll pick me up next time! After hanging out with Colleen and Mickalaya I noticed a little commotion over at the front counter and there’s The Baker, Karen with the newest addition to their family, Emily! Emily’s three and a half months old and I love how she posed for the MBIP Camera! And there’s her older brother Gabriel with a great smile on his face. You’d smile too if you got to grow up in a bakery! Okay, we’ve seen The Baker, where in the world is The Chef at? It’s sandwich time! They have a great choice of unique and homemade sandwiches made fresh to order daily. Check them out right here. Okay, while they’re back in the kitchen putting it together, we’ll settle in and take a look around in here. I decided to sit at the front counter and there’s some great family photos and Chef and Baker memorabilia to look at on the counter. There’s a picture of the three of them post-Emily and Karen pointed out a photo of Gabriel that was used by artist Devin McGlone as a reference photo for the mural on the wall. Very cool! There’s another mural that Devon did behind the front counter that was transported from the original Chef & Baker off of Prospect. Here’s the front bakery case that’s filled to the brim with sweet goodies! Check out the Cubbie Cakes in honor of the Cubs World Series win! Okay, it’s time for sandwich number 25 on this 52 week tour and there’s Ian serving it up! I got the box lunch which comes with a side dish and a cupcake! That cupcake looks amazing, but first let’s try out the sandwich! I got the PB & J, and that name is just a tad misleading, there’s no peanut butter and jelly here, the PB stands for “pork belly” and the J is for pickled jicama and pepper slaw. This sandwich looks amazing and I guarantee you won’t find anything else like it in Peoria, which I love! Okay, let’s try it out! Wow, this sandwich is so tasty and delicious! The pork belly is brown sugar cured and cut in thick slices and there’s also lemongrass cilantro aioli, pickled jicama and pepper slaw, fresh tomatoes, sliced red onions, and crisp lettuce. The sandwich is topped with Havarti cheese and it’s housed in a house-made hoagie roll. There’s so many different flavors that happen with each bite—the pork belly is the base flavor and it’s wonderfully complimented by the slaw, tomatoes, onions and the Havarti cheese. And the roll is perfect for the sandwich, it’s a dense and sturdy roll and made on the premises daily, so it doesn’t get any fresher than this. This is one wonderful and unique sandwich. 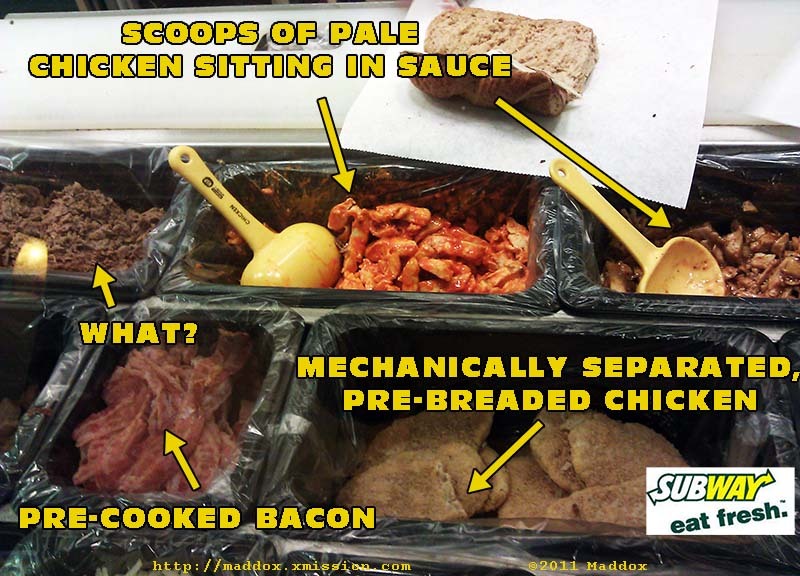 Try it and you may never enter another horrible Subway sandwich shop in your life! I was pretty full after that sandwich, but i had to try this cupcake. It’s a S’More chocolate cupcake with a creamy and rich marshmallow frosting and a graham cracker crust on the bottom. It simply doesn’t get any better than this! It’s like biting into three layers of sweet heaven! And if that wasn’t enough, Karen and Ian let me try a square of pumpkin cheesecake that was so good! I’m not a big pumpkin pie fan, but this was crazy tasty, so creamy and delicious! This would be a perfect Thanksgiving dessert, so you may want to call and order one today while there’s still time! And if all of that wasn’t enough, Ian gave me a bacon brownie to take home for later. I ate it after work and it was unbelievable. The brownie is dense and sweet and the bacon bits add a great savory crunch to the chocolate treat. Thanks to Ian and Karen for an unbelievable sandwich and lunch! In addition to eating at The Chef & The Baker, you can call in and get your order to go and they are also available for private catering if you have a corporate lunch, dinner or a holiday party. Just call the number below to find out about the catering options at The Chef & The Baker! Thanks to Ian and Karen for a wonderful lunch and afternoon, it’s always fun hanging out and eating at The Chef & The Baker! We’ll see you all tomorrow! Four Dagwood Bumsteads—The PB & J has to be one of the most unique and tasty sandwich creations in Peoria and you need to try it out today! And take my advice, get the boxed lunch with the cupcake, you can start your diet tomorrow, I just did! Related Posts: A Year In The Life Of A Sandwich @ 4th & Goal Grill, No Wake Zone, Agatucci’s, The Downtown Diner in Morton, The Exchange in Delavan, Big Behm’s Sports Bar & Grill, Chick-Fil-A, Jimbo’s Jumbo, Grandpa John’s Rib Shack, Khaki Jack’s, Blue Duck Barbecue Tavern, Green Gables Bar And Grill, Kenny’s Westside Pub, No Wake Zone, Picco’s Pit Bar-B-Que And Steakhouse, The Fox Pub, Leonardo’s/La Gondola, Castle’s Patio Inn, Kuchie’s On The Water, The 50’s Diner, Donnelly’s Pub, The Mix Sandwich Works, Nacho Mama’s and Jim's Steakhouse.